Parenthood is a beautiful chapter for most couples committing to a life-long relationship. The idea of having an offspring that would share characteristics from both of them is what truly excites them. Some couples would already be on top of the world when blessed with a child, what more when they will be expecting twins?— whether identical or fraternal. Taking into account the rarity of this circumstance, it makes it all the more a special and meaningful event of a couple’s lives. Expecting a child is already a blessing, what more when you expect two? You may also see baby shower invitation templates. And for such pivotal affair in your life as parents-to-be, baby showers are, in a way, fitting and necessary. This event makes the anticipation of the babies more special, as you get to do it with the people closest to you. From families, relatives, friends, colleagues, workmates, and so much more. Also, baby showers are organized to help you be equipped with parenting arsenals getting into the new life you will be having. It just lets you be more prepared by becoming parents with all the gifts guests will be showering you with. And in line with that, to make the event truly successful, guests should be invited and it should be done in a formal way through sample invitation cards. 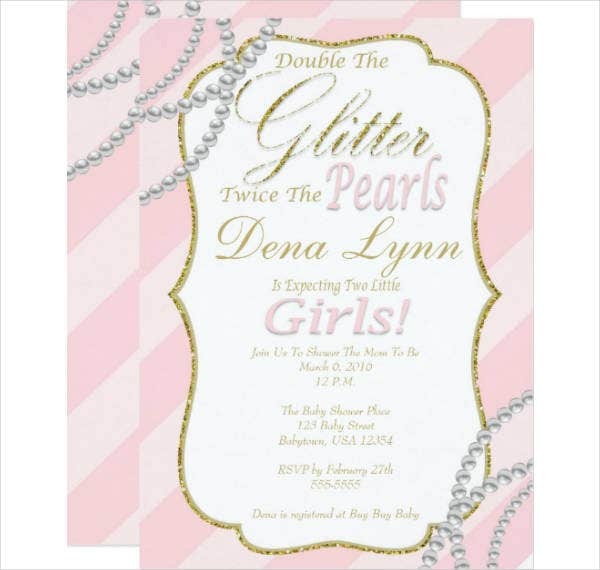 With that, here is a list of baby shower invitation card designs and templates perfect when you are having twins. Baby Showers: How it Started? How it is Celebrated Now? Baby showers were believed to have been derived from the long-standing tradition of bridal showers. It was during the Victorin era where friends of the bride-to-be gather together, including the woman the event is for, to send her well wishes and gifts. The idea of why it was called “shower” came was during the time when women would put their gifts in a parasol, which will be then placed over the bride-to-be to make it appear as if she was being showered with gifts. The tradition went on to strive until it became more simple and fitting for the modern times. Which also, prompted for baby showers to emerge— the same concept, different intent. Baby showers back in the day were commonly organized by friends of the parents-to-be, never the couple themselves or family members intermediate to them. This is due to the fact that asking gifts directly from people is seen as inappropriate by “etiquette sticklers”. That is why it was often imposed that close friends do the works for the couple. However, now that we are in a more modern age with people more open to different ideas, add to that the irreverence of some people to constantly steer away from tradition, the event has developed into something far from how it used to be. You may also see onesie invitation templates. Although some people still oblige to the “only friends can organize” rule of baby showers, more and more are embracing the idea of intermediate family members or even the couple themselves organizing the event. Such occurrence has led couples to organize baby showers that they prefer and envision— from themes, foods, games, and so on—with all the people they love present. You may also see christening photo invitations. There is an indefinite way to how you can opt to celebrate or maybe anticipate the coming of your twins. Depending mostly on what best suits the twins, whether girl and boy, boy and boy or girl and girl. There is simply a plethora of choices to choose from, ones that truly fit the idea of having twins as children. 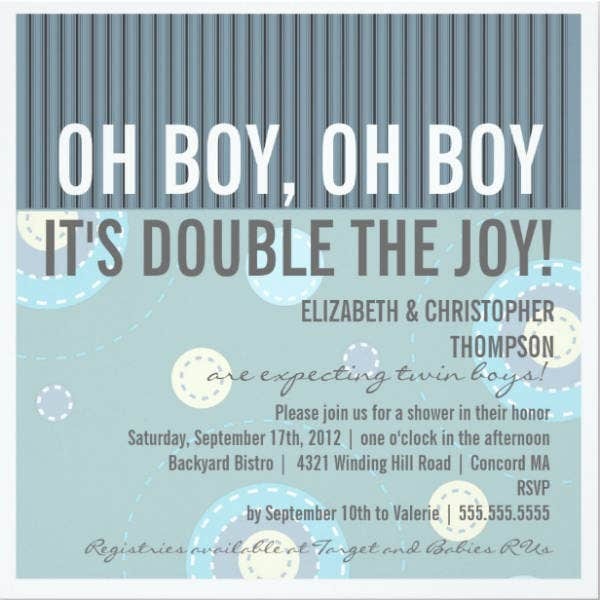 You may also see printable baby shower invitations. Timing is everything for baby showers. According to moms who have done so in the past, the most ideal time to have a baby shower is between four to six months before the due date. This is because, with this timeframe, you will still have an ample time to borrow or buy things necessary for your baby and more importantly enjoy the event with the company of the people close to you. That is why it is best if the event is set between those weeks. You may also see free printable baby shower invitations. This is a question often asked by mothers-to-be, “who should be invited to the baby shower?”. If it was set some years ago, men would be restricted from attending, but since it is now 2018, anyone close to you could be on the guest list— whether men or women. Family members, close relatives, friends, workmates, to name a few, can all be invited. There is so much you can go for when faced with the dilemma of what theme to go with for the baby shower. However, it mostly depends on what twins you have (whether all boys, all girls or mixed). In the case of you having all boys, you can simply go for a theme that is sporty or about cars; and if all girls, princesses or fairytales are an obvious go to. If mixed, you can simply combine the two contrasting themes together. If not, you can simply base it off on colors, with girls having pinks and boys having blues and if both, use the two together. You may also see baby shower invitation postcards. Baby showers do not have to be grand, it can be simply celebrated at home with a somehow elaborate home setup. One can add banners, music, finger foods to pack the set up with details. One can also add games in the event to make it even more fun; games that may or may not cohere to the idea of a baby shower. You can also try to do the growing trend of gender reveals on your baby shower, where no one knows what the genders of the twins, not even you the parents. This feature will add excitement to both you, parents to the twins and all the guests invited. There is just the sense of excitement not knowing what the gender of the twins is. Of course, sample invitation cards are a tradition all people are accustomed to when organizing an event of any kind. Invitation cards are mandatory despite the world now being social-media-centered, for it conveys a sense of formality that a simple text or chat cannot. Invitation cards serve as a prelude to the event with which give guests a slight idea of what to expect. So, having one before the actual event is necessary, for it not only informs guests about the coming event but it also gives them the excitement as well. 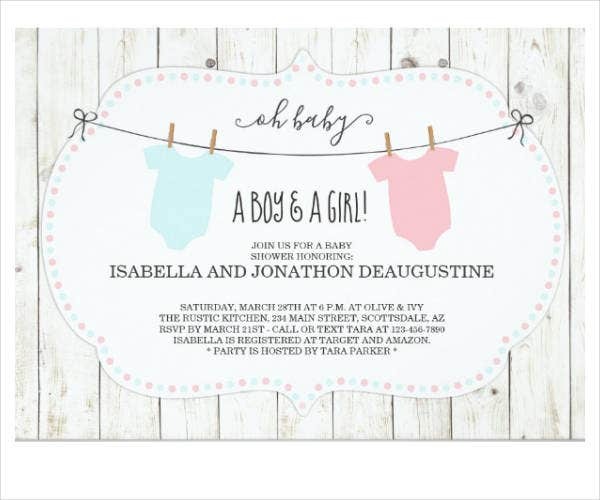 If you are unsure about where or how to get your very own sample invitation card for your baby shower, then there is an option that poses as practical and efficient— the pre-made option. Going for pre-made is simply buying designs and templates that are readily available online. But, why? Out of all the possible options available that you can acquire your very own invitation card, why pre-made? This is one of the main reasons why most people are drawn towards the idea of going for the pre-made option, is how affordable it is. Compared to other options (i.e. having it custom-made by a professional graphics artist), going for pre-made is essentially more affordable. This is because the graphics artists who create pre-made designs and templates create them without having to follow demands and requirements, just their own preference at their own preferred time. While if you compare it to having it custom-made, which can be really expensive since it is somewhat an extensive process, also considering that there is no cheap labor nowadays. You may also see whale baby shower invitations. With pre-made designs and templates, basic knowledge about the different design software can already help you create your very own invitation card. It does not need extensive information since all you need are a little creativity and the willingness to do it yourself. Also, taking into account the fact that it is pre-made, which means it is partially done, you can simply finish the initial design laid out by the graphics artist or use it as an inspiration to base your own version off of. You may also see baby shower photo invitations. Pre-made designs and templates are fully editable and customizable to your own preference. You can edit the texts, fonts, colors, sizes, and a few other elements of the design to however you want it to. 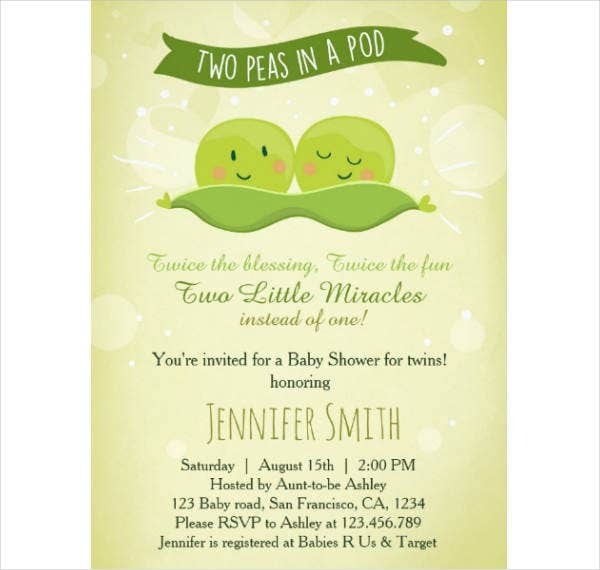 At times, it comes with smart object layers or vector files that enable you to move around elements in the design to create a more unique and personalized invitation card for your baby shower. With the pre-made option, there are a lot of design variations you can choose from, depending on what resonates to you the most. There are simple designs, modern designs, fun designs, and even printed designs that comes with floral prints, stripes, polka dots, to name a few. There is definitely one for every different preference with the pre-made option. If you find this article helpful in any way, do not forget to bookmark this page for future references. And, kindly share this with other parents-to-be or individuals helping out one seeking the best invitation card designs and templates for mothers expecting twins, to use.